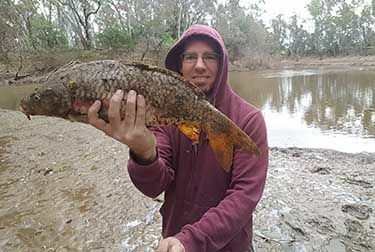 Alan Bonnici only survived 40 minutes on the Goulburn River near Shepparton after being eaten alive by Mosquitoes and Mud which became unbearable. However in that small session Alan managed 4 Carp around 55cm. Alan also caught a monster well over a meter but couldn’t land it without the net. Never quite seen Mosquitoes this bad however it gave Alan a great chance to check out other local systems such as Broken Creek, Lake Nagambie and Lake Victoria.